The World Series of Poker (WSOP), hosted annually in Las Vegas, is the biggest poker event in the world. It began as a single private table hosted by Benny Binion in 1970. Over the years, however, it grew into a series of tournaments, and each of those tournaments represents a particular poker variant and configuration. 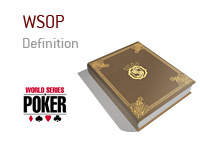 In its modern incarnation, the WSOP features most major poker variants. In 2011, there were 58 distinct events in all, including Heads-up, Omaha, Seven-card Stud, HORSE, razz, 2-7 Triple Draw, Badugi, mixed events and so forth. The showcase event of the WSOP is, and has always been, its no-limit Texas hold 'em tournament. This event receives the greatest amount of worldwide media attention, and the final table is a high-profile televised event. To each tournament winner, WSOP awards a bracelet and a monetary prize. Like most poker tournaments, the prize is based on the buy-in and participation. The bracelet is a distinction not unlike the Lombardi Trophy or Stanley Cup. In fact, the world poker community often describes its celebrities based on their WSOP success. With 11 bracelets, Phil Hellmuth has won the most titles, and with 3, Johnny Moss and Stu Ungar have won the most Main Events.